Lower Yosemite Fall drops 400 feet from a rocky ledge on the north side of Yosemite Valley to the flat forested land below, after which the creek flows gently through the pine woods for a few hundred yards and joins the Merced River. Although audible from some distance away, the falls are hidden by trees from most places in the immediate vicinity and only when close can a good view be obtained. 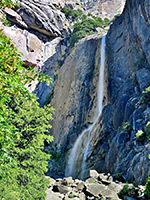 The falls are reached by a short (1/2 mile), nearly level, wheelchair-accessible path that starts from a parking area along the Northside Drive, close to the turn-off to Yosemite Lodge at the Falls (see East Yosemite Valley map), and winds through the fir and pine trees a short distance west of the creek. The trail ends at a clearing around a pool and many large granite boulders, onto which the raging white waters of Yosemite Creek crash down from the cliffs above - or at least they do in winter, spring and early summer, but most years see the creek dry up completely by late summer. The carpark is now closed to stop overcrowding, so hikers must park at the main day use visitor lot near Yosemite Village and either walk an extra 0.7 miles west or take the park shuttlebus. The beauty of the cascade is slightly spoilt by litter, and the number of visitors - the trail to Lower Yosemite Fall is the most frequented in the whole valley - but it is still a spectacular sight. The rocks around the base of the falls are wet and slippery, and exploring beyond the end of the official path is not encouraged. The trail does continue, crossing the creek on a wooden bridge and following the base of the cliffs eastwards, past the park headquarters and the village, all the way to Mirror Lake and Mirror Meadow. High above the lower fall, the much taller Upper Yosemite Fall is also reached by a trail, which starts 0.6 miles west along the road at Camp 4, formerly known as the Sunnyside Campground.